One piece that included the broadcasting TV animation “Flying Babies” opening theme “Flying Babies” from January 2019! A message by Osamu Suzuki, popular broadcast writer for lyrics, delivered the “Flying Babies” world. Do not miss listening to that one piece !! 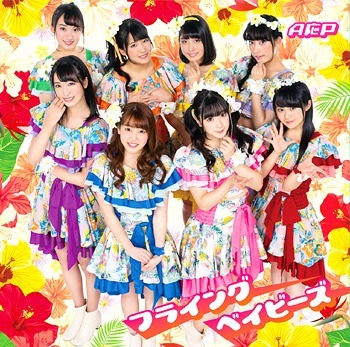 Anime “Katte ni” Ouen Project (アニメ”勝手に”応援プロジェクト), abbreviated as AOP (A応P), is an idol group produced by Nikkei Entertainment! which was introduced at Tokyo Game Show 2012. They recommend anime and talk about its appeal points through TV, radio, magazines, events, and the Internet. Their debut single “Never Say Never/Ari no Mama MY WAY (Never Say Never / アリノママMY WAY)” was released on April 5, 2013. AOP’s current lineup includes members Asahi Yuuna (旭 )優奈, Kudou Hinaki (工藤ひなき), Kojima Rin (小嶋 凛), Tsutsumi Yukina (堤 雪菜), Tomoe Kei (巴 奎依), Harusaki Non (春咲 暖), Hirose Yuuki (広瀬ゆうき), Hoshikise Ena (星希 成奏), and Mizuki Aoi (水希 蒼).